House Republican Ralph Hall, facing primary fefeat, says John Boehner should resign. 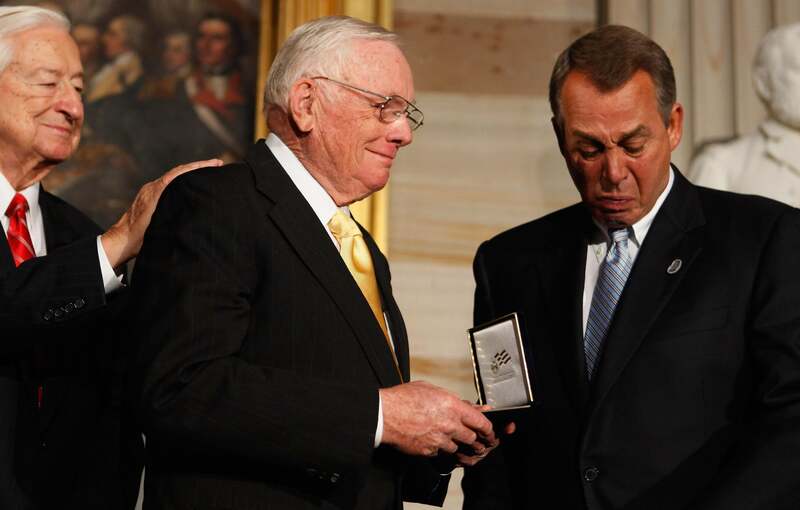 Good thing Neil Armstrong’s standing between Ralph Hall and John Boehner, so they don’t fight. Texas Rep. Ralph Hall was elected in 1980, as a conservative Democrat. He switched parties in 2004, after his East Texas district was redrawn and became ideal for a Republican and death for a Democrat. Ten years later, at age 90, Hall is running for re-election by telling voters no one will work harder to oppose Nancy Pelosi and vote down debt limits. That “age 90” thing has been a problem, though, and Hall failed to win more than 50 percent of the vote in last week’s primary. He faces a May runoff against John Ratcliffe, a former mayor and U.S. attorney, and he’s trying to outflank his opponent on the right. This, I’m guessing, is why he made a campaign trip to Texarkana and called for John Boehner to quit. The Ratcliffe campaign interprets this as a stunt. “After 34 years in Congress, the people of East Texas are learning that there is almost nothing Ralph Hall won’t say to stay in office,” said Daniel Kroese, Ratcliffe’s campaign manager. It’s not clear that the Boehner jibe even helped Hall; he made the remark weeks ago, they landed with a thud, and Ratcliffe forced the runoff anyway.